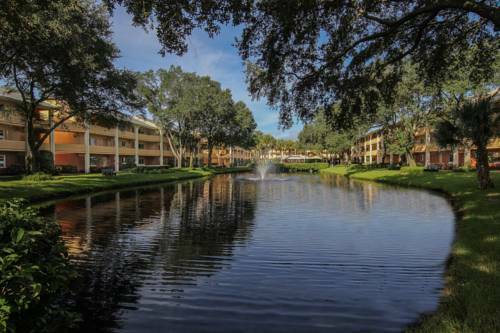 Ideally located within a 10- to 15-minute drive of Walt Disney World Resort- Universal Orlando Resort and SeaWorld Orlando- Westgate Leisure Resort boasts a serene environment in the heart of Orlando. Convenience is the key and the resort provides easy access to hotspots like world-famous International Drive- as well as great outlet shopping and championship golf courses. Guests enjoy spacious one- and two-bedroom villas- as well as a variety of onsite amenities such as two heated outdoor pools- two hot tubs- fitness facility- volleyball court- game room- Mini Market and Free scheduled shuttle service to Disney- Universal and SeaWorld. Located just off famous International Drive near SeaWorld and Discovery Cove. Close to all major attractions- shopping and dining just slightly off the beaten path in a quiet and serene setting with lush landscaping and a friendly staff. A relaxing retreat after a day in the hustle and bustle of exploring the City Beautiful.